Recycling your old refrigerator or freezer is not only one of the most effective ways to save money and energy – it also has big benefits for the environment. Our Appliance Recycling program makes it easy for our customers in Maryland to safely and responsibly dispose of select appliances. 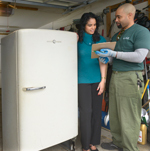 We’ll haul away and recycle your old, working refrigerator or freezer at no cost – and even send you a $50 check. You can schedule a pickup and get details online, or call 1-877-395-5540 today. And when you’re ready to purchase a new appliance, be sure to check out our Appliance Rebates program for savings on a variety of energy-efficient appliances. During Maryland’s Tax Free Weekend, February 16-18, residential customers in Maryland have a unique opportunity to save energy and money by purchasing ENERGY STAR appliances. This weekend, customers will not have to pay Maryland’s 6 percent sales tax when they purchase select ENERGY STAR certified products such as standard size refrigerators, clothes washers, room air conditioners, dehumidifiers, heat pumps, and compact fluorescent light bulbs. 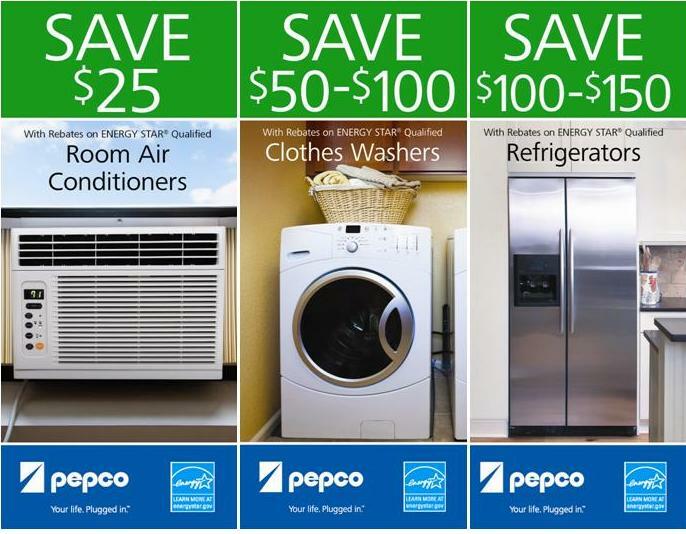 To save even more, we encourage Maryland residential customers to combine these tax savings with Presidents Day sales and Pepco rebates on select energy efficient appliances. Participating in Pepco’s Appliance Rebate Program is easy: simply purchase ENERGY STAR appliances at any retailer, and then print and submit one of the relevant rebate applications below for each qualified appliance. The Appliance Rebate Program is part of Pepco’s portfolio of energy efficiency programs that are designed to support Governor Martin O’Malley’s EmPOWER Maryland initiative to reduce energy consumption in the state by 15 percent by the year 2015.